We build up so many different concepts about what peace is. In America, they went around with microphones, and asked little kids, "What do you think peace is?" They answered, When the war stops it's peace," or, "When my mommy gives me chewing gum again, it's peace," or, "When I get out of school it's gonna be peace." This is just like our concept of peace. When we look at little children, we see that they are playing, they have games, ideas and thoughts of their own. We sometimes are very amused by their ideas and laugh at them; we don't give them any real significance. But wait. Look at us: we are no worse or no better than them. We have the same kind of ideas, on the same lines, as a matter of fact. To a little kid, that truck made out of wood is the toy. To us, the truck made out of metal is the toy. To a kid, that little airplane that goes, "Boooooooo," is good enough. For us, it's got to be a little bit more, but its the same thing. We think along the same lines, and we have concepts in the same way. How come we never sit back for just a second and look at ourselves in the mirror and say, "Mirror, mirror on the wall, who's the most satisfied of them all?- Because we haven't got the guts to. You see, it's very simple. It takes a lot o' guts. Today, talking about peace and satisfaction, peace of mind, and all these things, is very easy. A lot of people are trying to do that, but they are not realizing. Just look at it for one second. I am pretty sure that people who have been to school must have read history. In history books we read how, in Roman times, there used to be riots and wars, and people were really unsatisfied. We read about all these different things, and we say, "How ridiculous. They fought over these little things. They killed each other for being a king." Well, what about now? Its still not much better. We press the button once, and nothing happens; we press it twice, and nothing happens. Then we know that there is definitely a problem. But what would you call a person who comes into a room, turns on the switch and nothing happens, and then he turns it off again and turns it on again, turns it off again, turns it on again, turns it off again, turns it on again - the very same switch? And nothing happens. He knows nothing is happening. That's why he is going on and off, on and off, on and off. Yet all his life, he goes on and off, on and off, on and off, on and off, on and off, on and off. We would call that person stubborn and stupid, because he should look for the problem. There is a problem. That very switch is supposed to activate the light. If it doesn't, that means the bulb is out, or maybe there is no electricity, or maybe the switch itself has gone bad. So do something about that. Don't just turn it on and oft, on and off, on and off all your lifetime. Of course, it is easy to laugh at and very easy to say, "That's what you call a man like that: stubborn and stupid." But that's what a human being today is. He knows that no matter what he has tried today, or what has been tried for a very long time	not just since 1975, or 1974, or 1973, but since the time of our ancestors whose names we don't even know- it hasn't brought him peace of mind. But we are sitting here, trying the very same thing again, and again, and again, and again, and again. This is why 1 say history is like a pendulum. It goes "tick," and then it goes, "rock," and it goes, "tick," and it goes, "tack." It has to go like that. And it keeps on going like that. But the Perfect Master knows, because he is at a point which is so clear, which is so beautiful, which is so perfect. And this is why we call him - Perfect Master," the Master of Perfectness, he who is one with it, he who has accomplished, who has mastered, that subject, that art, that beauty, he who is the complete one, he who can show us how incomplete we are, and who can show us the path to perfectness. 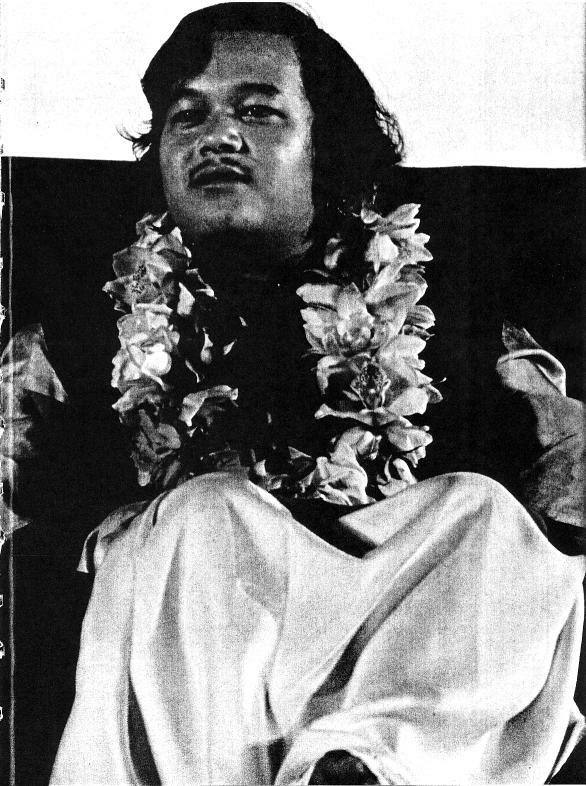 This satsang was given at the Pacific Guru Puja, Sydney, Australia, on October 19th, 1975, in the Opera House. might even call him stubborn and stupid, because he always repeats himself, too. He comes again and again and again into this world, but he comes for a very definite purpose. Whatever that purpose is, he tries to accomplish it, and does accomplish it to a certain extent. He comes here to show us that Knowledge, that peace. Now, I don't know how many of the premies here really do meditation, but this is a matter that we just can't put away in the back of our heads. This is a very important matter of human life. We are here for a certain purpose, a certain mission, which has to be accomplished. This is no joke. You see, this is no joke. Every time we see an initiator we can't just go to him and say, "Jai Satchitanand." And every time Guru Maharaj Ji comes, we can't just join the darshan line. Every time there is a satsang program, we can't just attend it, then go back home and never even think about meditation, never even do meditation, never even realize anything. We can't do all that just for the sake of joining a club named Divine Light Mission. Premies, let me tell you something. Divine Light Mission ain't a club, and this life ain't no joke. We are here for a certain reason. When we sit in that Knowledge session the first time and we experience something, there is something, and we definitely know that there is something. And we are told to do satsang, service, and meditation, and, I tell you, there is a particular reason behind it. Believe it or not - maybe you won't believe it, but this is how simple it is - right now your mind is controlling you. Our aim is to control the mind. This is exactly what we have to do to become one with that self consciousness. Because then there is nothing on top of us, nothing to prevent us from being one with that vibration, one with the self-effulgent, beautiful light, one with that experience. Then there is nothing that can block us, and then we can really experience. It's just a matter of turning the plug around. And you know, it's so beautiful. When you buy professional equipment and read all of the instructions manual, at the very back page it says, "Trouble-shooting Guide." It names each trouble, and says, "Your pause button is on," or, "Is it plugged in?" or, "Have you got the tape on the tape recorder?" "Is the cassette in?" It's just simple problems that make the tape recorder malfunction. But when you go to your Trouble-shooting Guide, you find out what the trouble is, you repair the trouble, and the machine works just right. That's all there is to it. So what is there to say to premies who have already received Knowledge - "Go ahead and receive Knowledge"? Well, we already have received Knowledge. And if you haven't, then go ahead and receive it. It's something that you have to experience. Let me tell you one more thing that'll make it clear for premies and for people who want to receive Knowledge, who really want to experience it: This mind will make every excuse possible to prevent you from doing meditation. You are sitting down to do meditation, and all of a sudden the mind goes, "Hey, what about your coffeepot?" "Hey, you left your blender on." "Why don't you shut off the television?" "Why don't you unplug it?" "Why don't you lock your door?" "Why don't you pull up your blanket? It's kinda cold." "Why don't you turn on the fan?" ''Why don't you turn up the air conditioner?" "Why don't you turn down the air conditioner?" It gives all the excuses in the world. For example, you are sitting and reading a magazine, and nothing bothers you. The blender is on, the television is on, the fan is up, the door is open, and everything is okay. Then you go to do meditation, and suddenly everything is wrong. Suddenly, everything has got to be just the way it should be. This is the way mind is. It's a very tricky thing, a very funny thing, a very sad thing, a very stupid thing, a very stubborn thing. It plays games that I can't even describe to you. It plays the trickiest games. Look: where this world is at right now is all mind's grace. I mean, where did it bring this world to? To cobalt: off goes the cobalt, and off goes this world. That's exactly mind's grace. It's not Lord's grace. haunting you like a ghost. It becomes very horrible sometimes for people, for premies. It's a torture, a regular torture. But, we have a weapon, and if any time it tries to snag us, all we have to do is turn around and say, "Boo!" and it'll be gone. We have to experience it, and there is a lot of experience that a person goes through before everything starts getting clear, before everything starts making sense, before everything is okay. A lot of premies, I bet, are on the verge of just saying, "Well, it was a pretty good experience, but … I can't go through with it." It's a fact. I know it. But that is the time when you should keep on truckin'. You see, a soldier who is losing will put more and more and more effort into the battle until he has put his maximum effort into it. Mind is like a soldier fighting you, and it will try to do everything. It will use the last drop of strength it has. But if at that time you say, "Oh boy. This is too much," then you have had it. Let me advise you about something. If this is what you are going to end up doing anyway, I suggest that you just don't even meditate. You see, there is also one more problem. There are disadvantages to things as well as advantages. Of course, in Knowledge there are very few disadvantages and a lot more advantages, because the greatest advantage of them all is there, in this Knowledge. But there is a disadvantage too. It's like, if you have milk, which is very good for you to drink, very nourishing, and very tasty - I personally don't like it, but that's what other people say - and if you don't drink it, boy, it tastes and it smells very, very bad after a little while. It becomes worse, and worse, and worse, and worse, and worse, till you just can't stand it anymore. That's the way this Knowledge is. It sits inside of you, it is there, you have understood that experience, and that thing that drove you to this Knowledge is striving harder, and harder, and harder, and harder within inside of you to have that experience, but you are not having that experience because you are not even meditating. I tell you, some premies just leave, and say, "Okay, we call it all quits." Then after a year or so they come back, and boy, do they look in bad shape - in and out, both ways. Mind has become a lot stronger in that time. So beware of mind. It's a very, very tricky thing, and it can trick you any time, it can get you any time. It's a loaded gun, and it'll go off any time. So just keep on meditating, just keep on truckin'. One of the beautiful advantages, that we have in this age of darkness, is that the chief engineer is with us. In case anything goes wrong, give him a call, and he'll come with his yellow flashin' light, take care of your car, and you'll be back on your way. So there is no problem. Just keep on truckin'. If you don't keep on truckin', you'll just discharge your battery, and then you won't even be able to give him a call, and then he won't be able to even come to you. So just keep on truckin'. As long as you do that, there is no problem. If we have realized this Knowledge, then we know that the solution, the answer, to the world's problem is this Knowledge. We know that. At least I know that. You see, this world is getting more and more crazy every day. Too many cooks spoil the pot. In the same way, there are just too many minds going around independently doing whatever they want. But this Knowledge can really put them in their place - where everything can be really beautiful. So premies, thank you very much for coming here. It's an experience for me, and it's an experience for you. I hope you enjoyed this festival, and I hope we can have one again. I don't know if it will be Guru Puja again; it might be some other festival. And really tell people about this Knowledge, because putting aside all of what's been said about the Mission, putting aside all the phoney baloney that goes on in people's minds about this Knowledge and this organization and about me and about the premies, we know people need this Knowledge. And when we tell them about it, something gets triggered. its just really beautiful, because so many brothers and sisters in this world can realize how beautiful this experience is, and share this beautiful experience with us, so that they can be out of their misery. Really, if you look around, they are our brothers and sisters; they are just like us. But they are in misery; they are really suffering and they don't even know it. You see, this is the sad part about it: they don't even know it. So what we have to do is go out and spread the word that, "Yeah. You can have the experience that you have been looking for."